From single shift to 24x7 operations, Orange EV electric terminal trucks are operating 24+ hours on a single charge. 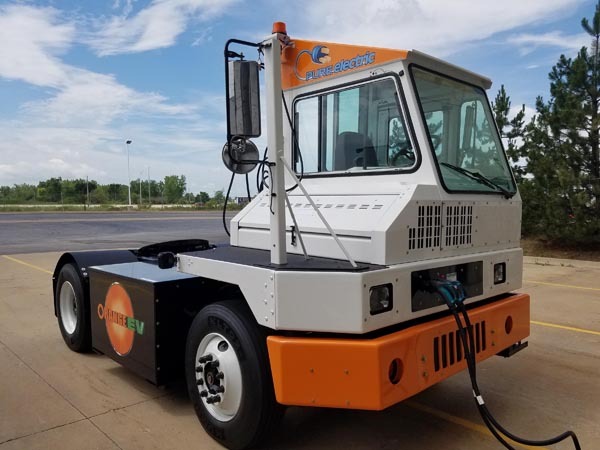 Orange EV specs both the charging solution and truck configuration to meet site-specific demands and duty cycles. Orange EV’s commercially deployed trucks are working more than 24 hours on a single charge. Battery endurance varies much like a diesel truck's fuel economy which can be higher or lower based on how hard the truck works. Contact us for what to expect at your site. Batteries will charge fully in as little as two (2) hours. Trucks can plug in and recover charge throughout the day, taking advantage of routine downtime during breaks, lunch, shift changes, and any time when parked. If starting at a higher charge (e.g. 50% still on the battery) then a full charge takes about half the time. Most fleets routinely recover battery throughout the day (see ‘Opportunity Charging’ above), plug in at a higher charge, and reduce overall charge time. Charging stations charge one truck at a time but can serve multiple trucks, rotated to charge as needed. So instead of a 1:1 ratio of charging stations to trucks, sites may install one station for every two or three trucks. Every site is different regarding electrical capacity. Most sites already have what’s needed for their initial trucks. Our team will work with the site facility management team and electrician to understand what’s available and to identify potential charging solutions; this is work with which qualified electricians are already familiar. Orange EV’s lithium ion batteries are sealed, maintenance-free, and can be charged at any time from any level. They are more robust and easier to manage than cell phone batteries or the lead acid batteries used in some forklifts. Most sites with diesel trucks have backup trucks for maintenance, repairs and peak times. We expect your total number of trucks may initially remain the same for similar reasons (primary and backup), but with familiarity will likely decrease due to the higher reliability of Orange EV trucks and rich telematics data enabling better truck and fleet management. Request a quote to learn what to expect in your environment.